Thanks Erin! My photographers have great posing direction! Their debut collection, ‘The Original 9,’ was inspired by a group of nine professional women tennis players, who were fighting for equal rights in the 1970s. These women were led by tennis champion and women’s rights activist- Billie Jean King. Every garment is named in honor of one of those nine inspiring athletes, and features retro-inspired silhouettes. The website even gives mini bios on these women, along with the product descriptions and such. I had the opportunity to test out some of their signature pieces, which you see in the photos below. I was able to pick out a couple choices, so I thought….well, golfing and hiking are pretty popular here in Phoenix area, so let me focus on that! I must say that after spending some time wearing Angle New York, they definitely stay true to everything- fit, functionality, and breathability. The fabrics were flexible and light, making it easy to get a hole-in-one. 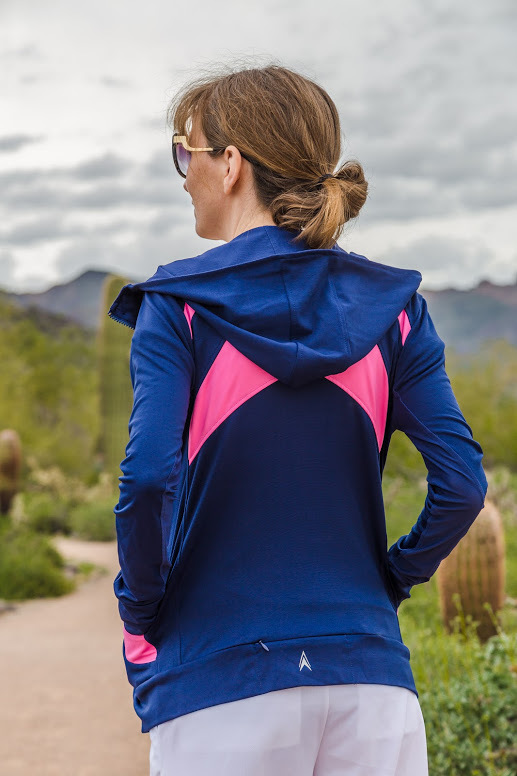 I especially liked the Peaches Hooded Jacket, with the convenient pockets and the little “secret” zippered compartment in the back; and the Crissy Tri-Layer Angle Skort due to its sleek design, and also that I can not only wear it for working out, it’s also cute enough to run errands in right after. Let me know in the comments, what your favorite Angle New York garment is, and what your favorite workout routine is.